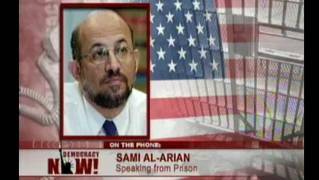 The Case of Sami al-Arian | Democracy Now! lawyer for Sami al-Arian, who is imprisoned and awaiting trial on charges of racketeering and conspiracy to commit murder. That day, the Justice Department handed down a sweeping 50-count indictment against Al-Arian and seven other men, charging them with conspiracy to commit murder, giving material support to an outlawed group, extortion, perjury, and other offenses. An indictment against Al-Arian had been rumored for months, but the one returned by a federal grand jury in Tampa was more expansive than most observers had expected. It accused Al-Arian of masterminding a terrorist support group that thrived in south Florida for nearly 20 years. Sami Al-Arian was a tenured professor of computer science at the University of South Florida. In his personal life, he was known as an outspoken Palestinian activist and frequently spoke on college campuses. He had had previous encounters with the FBI in the mid-1990s, when the office of a group he established was raided by federal agents and al-Arian was under investigation on suspicion of aiding terror groups. Though Al-Arian was investigated for two years, he was never detained or charged with a crime and continued to work for the school…that is, until he got a call from the FOX News Channel. In late September 2001, al-Arian was invited to be a guest on The O’Reilly Factor. Al-Arian thought he was going to be discussing Arab-American reactions to the attacks. Instead, host Bill O’Reilly went on a tirade against him, basically accusing al-Arian of supporting terrorism and terrorist groups. O’Reilly dug up comments al-Arian had made 15 years earlier and suggested that he should be followed everywhere he went. All of this on live international television and just weeks after the 9-eleven attacks. Here is an excerpt of that program on September 28, 2001. O’Reilly begins by referring to al-Arian’s connections to former colleague Ramadun Abdullah Shallah who later resurfaced as head of the Palestinian Islamic Jihad. The O’Reilly Factor, September 28, 2001. Beginning the next day, the University of South Florida, where al-Arian worked was barraged by hundreds of threatening letters and emails. Thirty-six hours after the interview, the university put Al-Arian on paid leave. In October of 2002, a few months before his house was raided and he was put in prison, I had a chance to interview Sami al-Arian at an antiwar demonstration in New York, commemorating the one year anniversary of the US invasion of Afghanistan. Interview with Sami al-Arian October 6, 2002. Sami al-Arian has now been in jail for more than a year and his trial is set to begin in January 2005. Linda Moreno, lawyer for Sami al-Arian, who is imprisoned and awaiting trial on charges of racketeering and conspiracy to commit murder. AMY GOODMAN: Here is an excerpt of that program on September 28, 2001. O’Reilly begins by referring to Al-Arian’s connections to former colleague Ramadun Abdullah Shallah who later resurfaced as head of the Palestinian Islamic Jihad. BILL O’REILLY: …taking credit for all kinds of terrorist activity and you know him pretty well. Got an explanation here? SAMI AL-ARIAN: Well, I mean, when he came here he came as a volunteer, he was working in an intellectual think tank and he talked with the University and then he left. He said that his father was sick and he was going back to the occupied territories and then six months later, we were shocked like everyone else in the world in which he became the leader of the jihad. BILL O’REILLY: You were shocked? You couldn’t understand it. He never told you that his — that his views, his political views were that extreme. You were just taken by surprise? SAMI AL-ARIAN: Everyone was. Everyone who knew him here at the University of South Florida, everyone who knew him personally was extremely surprised. BILL O’REILLY: With all due respect, I appreciate you coming on the program, but if I was the C.I.A., I’d follow you wherever you went. AMY GOODMAN: That was Bill O’Reilly on “The O’Reilly Factor,” challenging Sami Al-Arian. Beginning the next day, the University of South Florida, where al-Arian worked was barraged by hundreds of threatening letters and emails. Thirty-six hours after the interview, the University put Al-Arian on paid leave. In October, 2002, a few months before his house was raided, he was put in prison. I had a chance to interview Sami al-Arian at an antiwar protest in New York, commemorating the one year anniversary of the US invasion of Afghanistan. SAMI AL-ARIAN: Starting a war in Iraq, whenever you have war and oppression of a state, rest assured you’re going to have a repression and injustice at home. And we must really fight very hard to restore our civil liberties, especially with the Patriot Act. It is an act that really takes away much of what people take for granted, not just for immigrants, but it will affect every single person, and I believe there is a sunset provision in 2005, What we need to do is educate the people about the effects of this very dangerous act and mobilize and organize so that when it comes to a vote again in 2005, that will be the end of it. AMY GOODMAN: That was Sami al-Arian. He has now been in jail for more than a year and his trial is set to begin in January 2005. We’re joined in our Tampa studio where Democracy Now! Is broadcasting from today, by Linda Moreno. She is a lawyer for Sami Al-Arian who, again, is awaiting trial on charges of racketeering and conspiracy to commit murder. Welcome to Democracy Now! LINDA MORENO: Nice to be with you, Amy. AMY GOODMAN: Linda Moreno, what is happening to Sami Al-Arian today? LINDA MORENO: Well as we sit here today, 17 months after his arrest, he still resides in an 8 by 12 cell. They have Dr. Al-Arian in the maximum security wing of the Federal prison in Coleman Florida. They have a special name for this wing, it’s called the “Shoe Unit” or the “Special Housing Unit.” This is a place where the worst of the worst prisoners are kept. These are convicted felons, convicted of murder and terrorism, racketeering, drug trafficking, and what have you. We must remember that Dr. Al-Arian is a pre-trial detainee and he and his co-defendant are the only pre-trial detainees in the entire prison complex. The conditions of confinement are disgraceful. Amnesty international has written the Bureau of Prisons, requesting information and criticizing the gratuitously punitive way they’re keeping Dr. Al-Arian. Dr. Al-Arian is denied the same privileges that the convicted felons enjoy most frequently. He is not allowed contact or visits with his family at all, unless there is a motion made before the court. He is not allowed to purchase the same foods items from the commissary that the convicted felons are allowed. He is not allowed tea or cheese or tuna. They don’t give him adequate pencils and stationary for him to work on his case. So the conditions of confinement have not been ameliorated. To give you a vivid example of that, when he comes in to meet with his lawyers, they refuse to manacle him in front of his body. They always manacle him behind his body and they refuse to assist him in carrying him in his paperwork. So, they lead him into the conference room bent over, manacled behind his body with his documents on his back like a beast of burden. This is the treatment that the pretrial detainee, Dr. Al-Arian, is receiving. So, the conditions of confinement are gruesome and we are very concerned about that. AMY GOODMAN: What can you do to change the conditions? LINDA MORENO: Well, we have gone to the courts and requested an amelioration of those conditions. We haven’t gotten any relief yet. It is an open issue. One of the things that we’ve been told by the prison officials is that they’re not set up to house pretrial detainees, and that the reasons these conditions are imposed on Dr. Al-Arian are for his own safety. However, it’s ironic that the other prisoners in the complex really are quite protective of Dr. Al-Arian. So, the question is: Who is Dr. Al-Arian being protected from? Is it from the other prisoners, or from the prison itself? AMY GOODMAN: And what about the actual charges? LINDA MORENO: Well, it — he is charged in 27 of the 50 counts in the indictment. We do have a trial date of January 2005, and we are preparing for trial. This is a case that involves about a 13-year surveillance on Dr. Al-Arian’s home, his offices at the University of South Florida. These are wiretaps that were on all members of his family and so on. So, we’re in the middle of discovery on this case and we’re fighting very hard. AMY GOODMAN: Hmm. Well, Linda Moreno, I want to thank you for being with us. If people want to follow the case, is there a website they can go to? LINDA MORENO: I think that the family has a website called http://www.freesamialarian.com. AMY GOODMAN: Well, I want to thank you for joining us, and all contacts you can get on our website at democracynow.org.